Born Pretty Store sent me this set of polishes to share with you. They are meant to be worn together for a gradient look. The trio I received is #04, and includes a silver, a middle darker grey/silver color, and a black. All three have some chunky holo bits in them, too! Since I can't read the instructions on the back of the package as to whether or not you are supposed to use a sponge, like you would with a normal gradient, I just used the bottle brushes to create my gradient. It isn't too hard to figure out since they are labeled A, B, and C on the tops of the bottles, anyway. Just has a size comparison, here is one of the polishes next to a full-size bottle of Orly, and a mini China Glaze. Each glitter polish is 6ml, or 0.2 fl oz, which is close to being 1/3 smaller than a ChG mini; so they are very small bottles. There are nine different sets including green, pink, purple, and gold. They normally sell for $5.70 USD, but are currently on sale for $3.99. If you saw my post on Instagram, you saw I started out with two coats of the first polish, then two of the middle polish, and two of the third polish. The picture on the far left is one coat of the first polish. Next is two coats of the first polish. The third picture is two coats of the first polish, and one of the second polish. The final picture on the right shows two coats of each polish, plus one coat of Seche Vite topcoat. After seeing how patchy the initial coat was, I was afraid I would need more than two coats of each and my tips would end up being ridiculously thick, but I was pleasantly surprised! I tried to keep my coats pretty thin, to help avoid too much buildup, and help the color transition smoothly. On my second (and third) color, I actually started it a little higher up my nail, then did my second coat with it a little further down, which helped to make an easier transition between colors, too. Other than the teeny amount, I was pretty impressed with this set! I didn't expect such a smooth gradient, or such a good density of glitter! In this set especially, the colors are just right, and the glitter is perfectly dense. They aren't so full of glitter that you just end up with stripes, yet the base is just tinted enough that you can build it up to whatever opacity you want. Plus, this glitter is NOT a topcoat eater, like a lot of them tend to be! I applied one coat of Seche at the end, and they were perfectly smooth! I love that! So all-in-all, I definitely recommend these sets! Other than the size, I have absolutely zero complaints about this trio! As always, if you're interested in picking up a gradient trio or anything from Born Pretty Store, I have a coupon code! 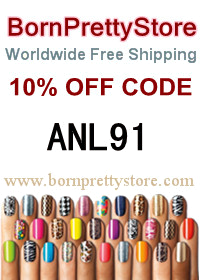 Enter ANL91 at the checkout and you'll get 10% off your order! This product was provided for my honest review from bornprettystore.com. I received no compensation. If I See One More ____ Mani, I'll Puke!